Union minister M Venkaiah Naidu has been named the vice-presidential candidate of the ruling NDA coalition. The BJP Parliamentary Board took the decision on Monday evening at a meeting attended by Prime Minister Narendra Modi. 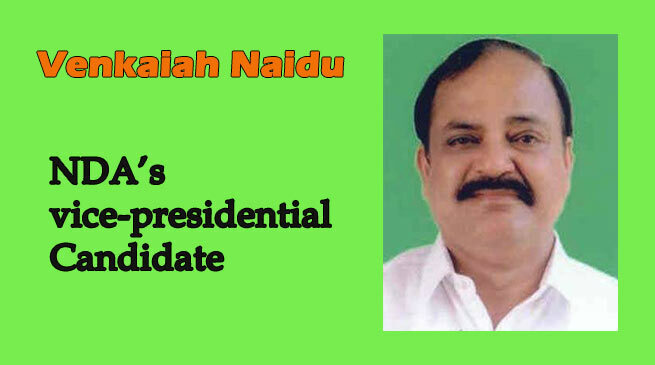 Mr Naidu will file his nomination papers as the NDA’s vice-presidential candidate tomorrow . The BJP is keen to have a vice-presidential candidate representing one of the southern states, where it wants to strengthen its presence. Prime Minister Narendra Modi said Naidu was admired across the political spectrum and was a fitting candidate for the office of vice-president. Naidu’s vast experience as a peoples’ representative will help him discharge the role of Rajya Sabha chairperson, PM Modi said in series of tweets following the announcement. A farmer’s son, @MVenkaiahNaidu Garu brings years of experience in public life and is admired across the political spectrum. The vice-presidential election will be held on August 5 and the last date for filing of nominations is July 18. An alliance of 18 opposition parties, including the Congress, has already announced Gopalkrishna Gandhi as its candidate for the vice-presidential poll.